Meru, a co-production of the U.S. and India (and seemingly North Face, from all of the product placement that sits perfectly in focus and in frame, and I’m pretty sure the company was thanked two separate times in the credits) is at its best when we’re up on the mountain with these dudes, gazing into the abyss. There are also scenes about the food they had to make do with—frozen bricks of couscous, roasted cheese rinds. Interspersed throughout these images from above are the testimonials (that seem to have been filmed in the same Photomakers studio at the mall where the girls at my middle school got themselves immortalized) that not only repeatedly remind us that none of the major players actually died in the making of this movie, but that describe for us the up-close-and-personal details of the climbers’ lives, details that may have felt important for the filmmakers (i.e. the climbers in question and their loved ones) in order to paint a full picture, but which really just serve to slow everything down. Like all documentaries, this one is probably best-appreciated by those who know little-to-nothing about the subject or who comfortably chill at amateur status. Whenever someone actually knows anything substantial about a documentary’s focus, they always seem to ruin the party by pointing out the all the inaccuracies and untruths that inevitably populate a movie product. But I would imagine there’s little risk in the experts even seeing this one, let alone ruin the fun. These dudes do a great job presenting themselves as the real deal, men who would travel the country one truck-bed at a time and not waste time with the family/jobs/normalcy that the rest of us settle for. Pretty sure there’s little chance of conquerors like that staring at laptop screens while lying on their bellies on their beds adding documentaries to their queues. The fantasy of escape into an extreme lifestyle is always appealing to any participant of screen-time culture. At least there’s someone out there living life while we scroll up, down, left, right and rationalize our fear-based lives. What we want is to nurse the idea that we’ve gained an insight into these extreme lives. This film falls pretty short of providing much of that insight that feels very genuine, but it does get us started on some good fantasy-cookin’. I can’t help but feel bad for the images from atop Mount Meru, a view that I imagine could be characterized as “holy” or “transcendent,” yet are doomed to be imprisoned to the scope of a small screen in bedrooms with the volume turned down because it’s late. 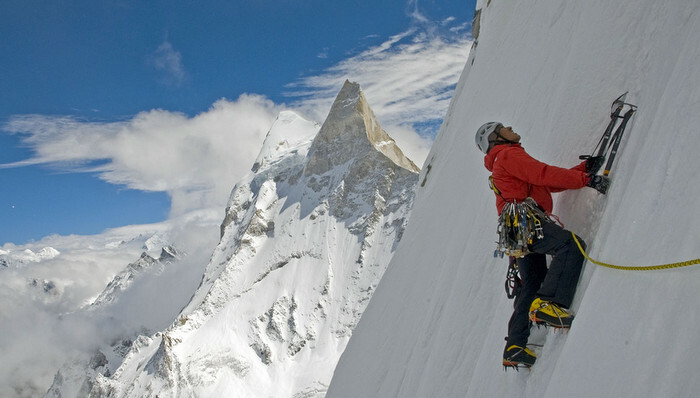 A mountain-climbing travelogue ought to be screened at one of those IMAX theaters they have at science museums where the screen actually wraps up into the ceiling. But I know that’s not the time we’re living in. The very technological milestones that have enabled Meru’s production are complicit in the creation of the movie culture that pushes films of its ilk out of the multiplexes to make way for phase 3 of the MCU. 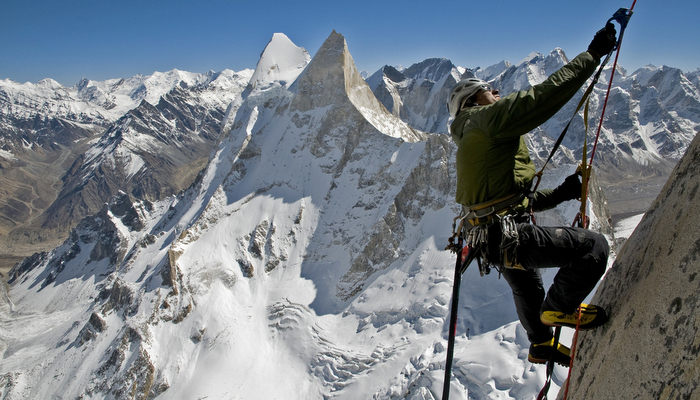 Meru will be a good footnote in film history if for no other reason but the fact that it was filmed by actual climbers themselves. Quentin Tarantino and other haters can say what they will about digital filmmaking and how it distances the creator from the emotional core of the subject (or whatever it is they say….not sure I’ve ever heard that coherent an argument), but the truth is that these are images that would never have been possible to capture before this era. This is a story that could never have been told by the story’s actual subjects before technology had given us such lightweight digital cameras. Is that enough? Even if this film doesn’t feel like a particularly valuable use of that technology, it’s always great to see movie-making climb new heights, right? Or do some images and experiences lose too much in translations when we capture them digitally? 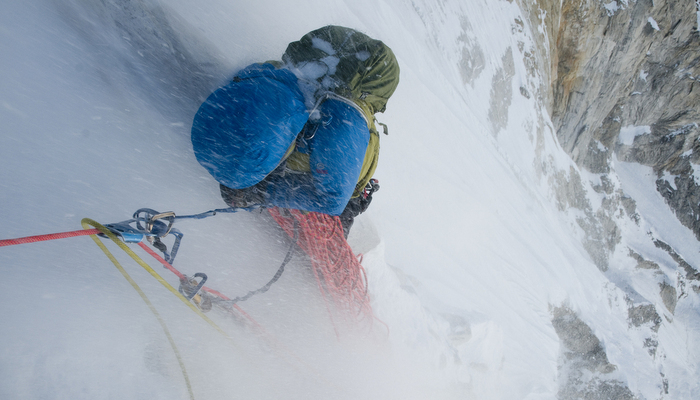 CONCLUSION: While it may not inspire too many non-climbers to scale some peaks, Meru gives us a glimpse into the real psyches and lifestyles of real mountain climbers, with minimal gloss. Serious aspiring climbers should take note. 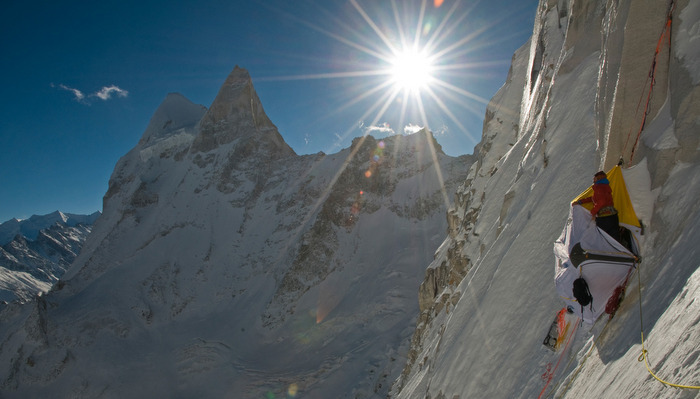 This entry was posted in Documentaries, Out in Theaters and tagged Conrad Anker, Documentaries, Jimmy Chin, Jon Krakauer, Meru, Out in Theaters, Renan Ozturk, Reviews. Bookmark the permalink.